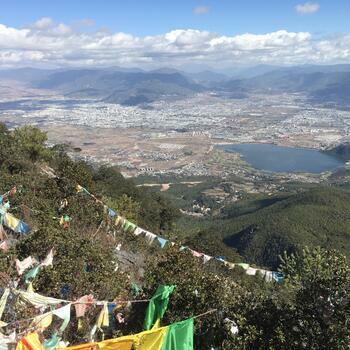 On my first visit to Lijiang, Wenbi Mountain (文笔山) caught my eye, and justly so. Its distinctive triangular form rises prominently on the southwest horizon. 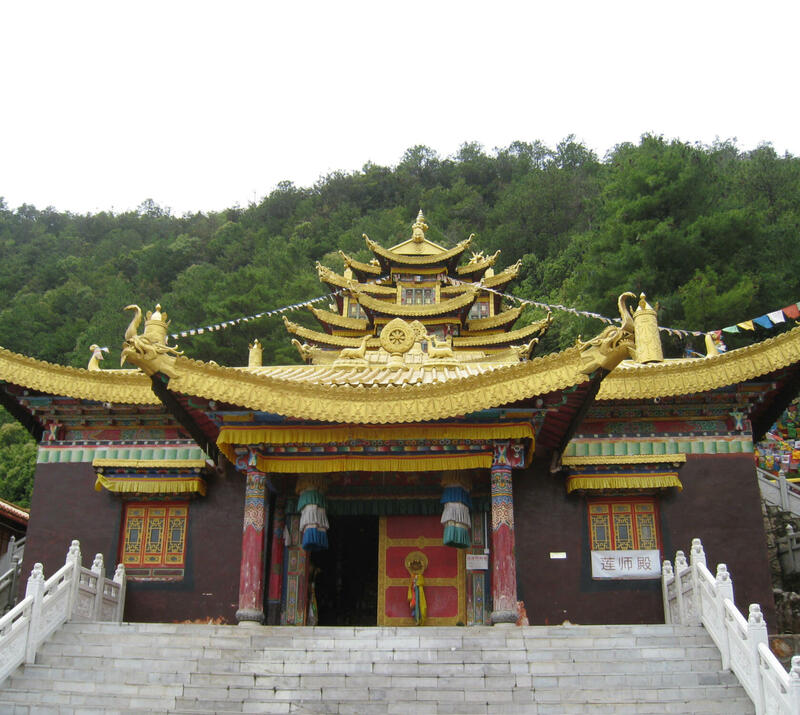 Wenfeng Temple (文峰寺), a Tibetan Buddhist monastery on the lower slope, adds to the allure. When the light is just so, the temple is readily visible from many streets in the city. 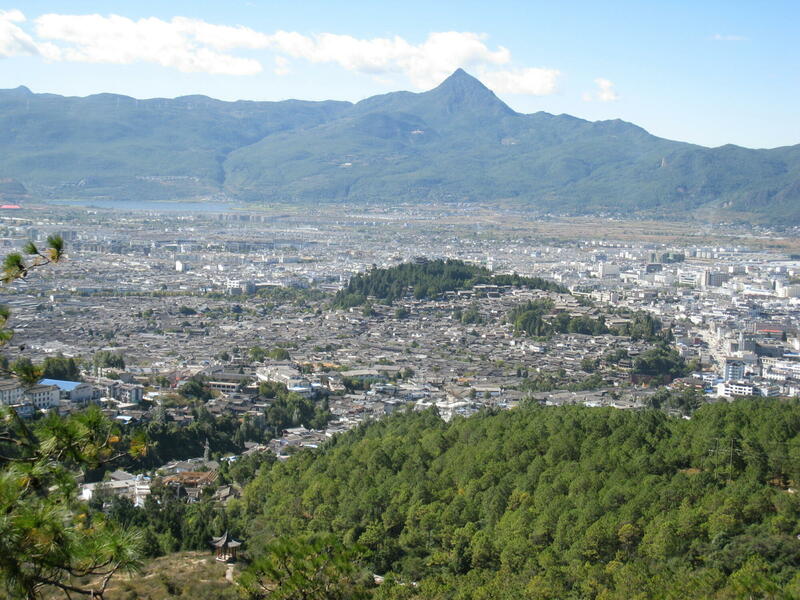 Wenfeng is one of 'The Five Famous Temples of Lijiang', the other four being Fuguo (福国寺), Yufeng (玉峰寺), Puji (普济寺) and Zhiyun (指云寺). 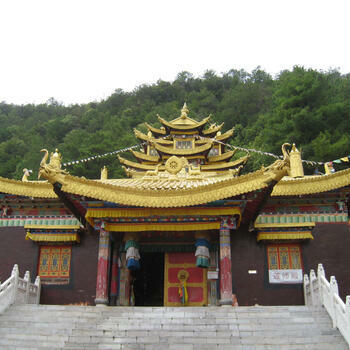 Wenfeng Temple was built around the year 1733 during the reign of a Naxi king named Mu Tian. 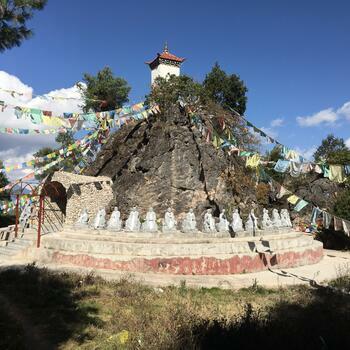 Information available on the web adds this curious detail: "Above the temple is a hole in the earth, near a sacred spring, where monks would stay for over three years to engage in intense meditation." This reminded me of Peter Goullart's book, Forgotten Kingdom. 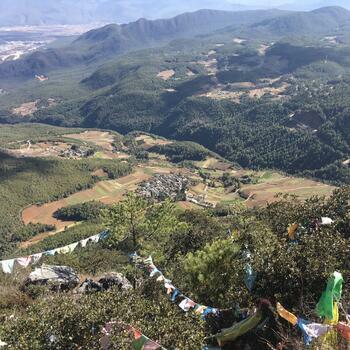 He described attending a celebration for monks as they emerged from their cloistered cave after three-plus years. 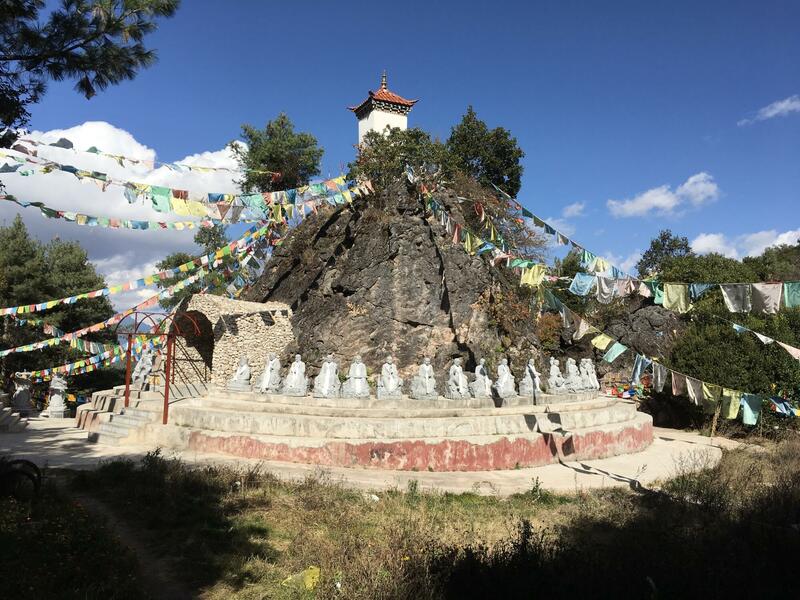 For this and other stories about everyday life in 1940s Lijiang, Goullart's informative memoir makes for excellent reading. 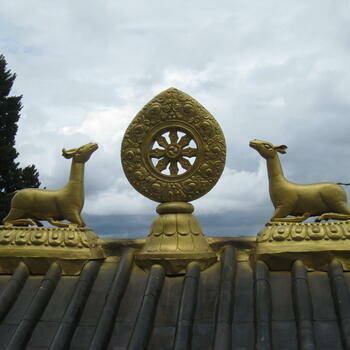 Temple buildings scatter over a wide area. However, there are two main compounds, upper and lower. 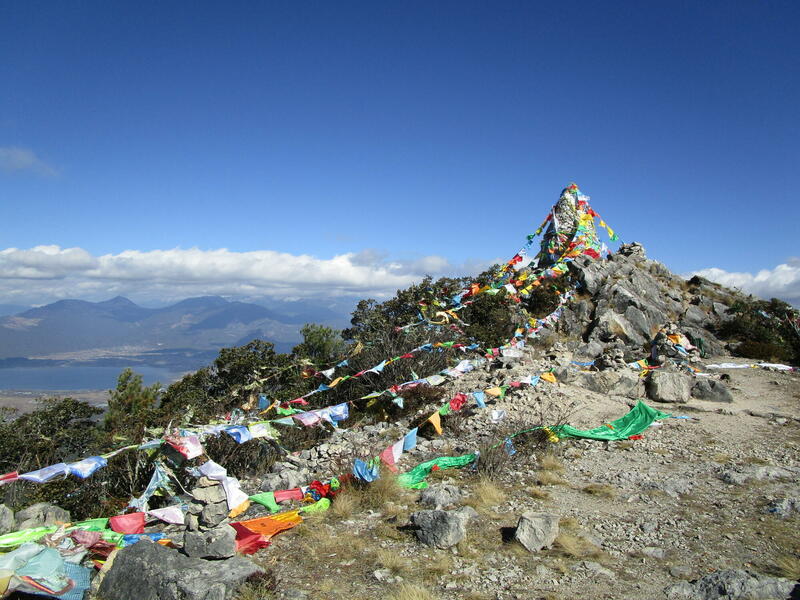 The ascent route described here starts at the upper compound, at an elevation of 2,800 meters. 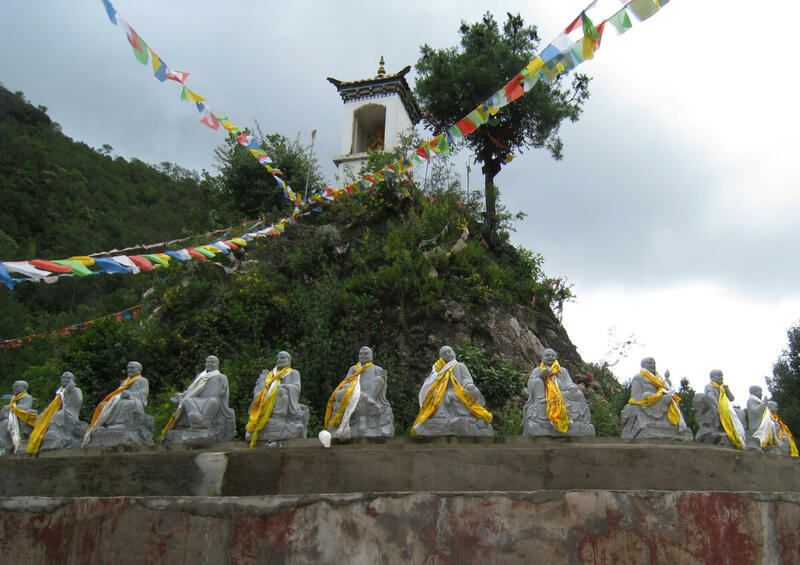 Along the way you pass the Arhats, a circle of seated statues. 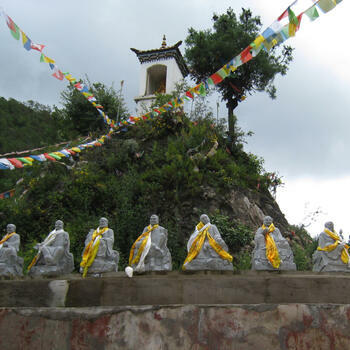 These 42 figures, plus a Buddha deity cloistered inside an alcove, represent souls who have stepped off the cycle of reincarnation, or who have made substantial progress toward the goal of nirvana. 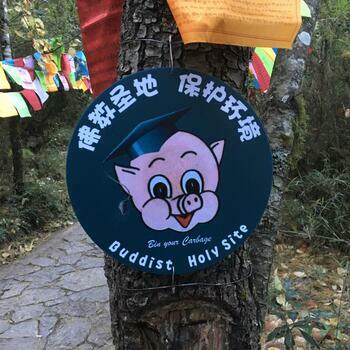 At the upper compound of Wenfeng Temple, I observed red-robed monks prostrating and assembling for rituals and ministrations. A lounge provided opportunity to rest and mingle. 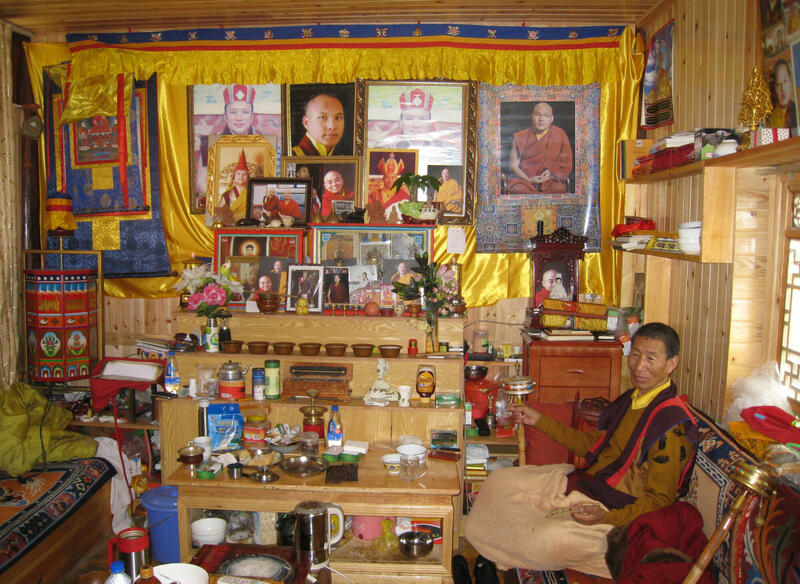 Photos of many monks lined the walls. 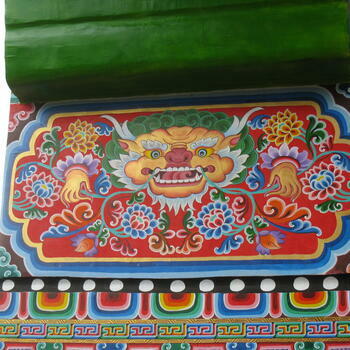 Here I was offered fruit and Tibetan yak butter tea. The fruit I happily accepted. The tea, well, I managed to sip a little, which felt like a stone dropping into the pit of my stomach. 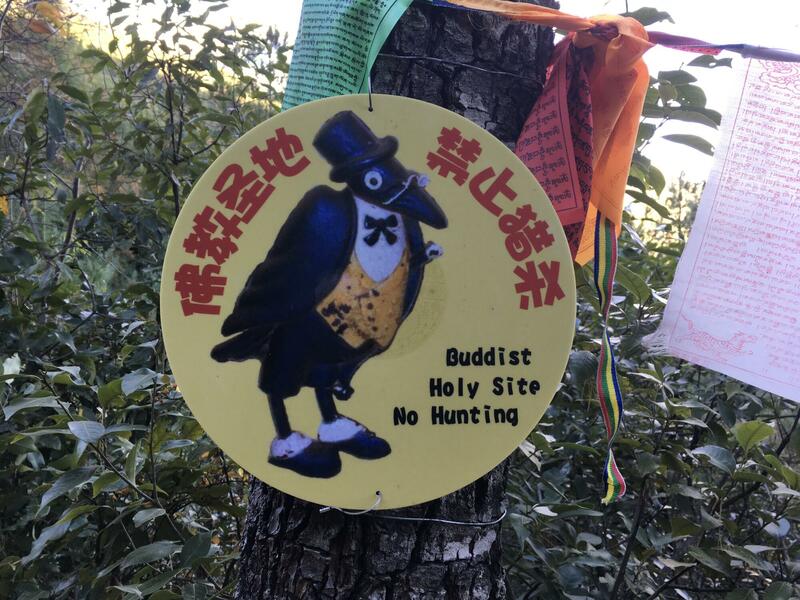 I labored to communicate with the monks due to their dialect and my poor Chinese, but one of them from Taiwan spoke English. I had arrived at lunchtime and enjoyed a simple meal in the temple dining room — visitors welcome, donations requested. Back in the lounge, two of the monks sat chanting and twirling devices with the intent, I assumed, to accelerate their spiritual journey. When I revisited the temple more than a year later, the same two men sat in the same two chairs, chanting and twirling as before. 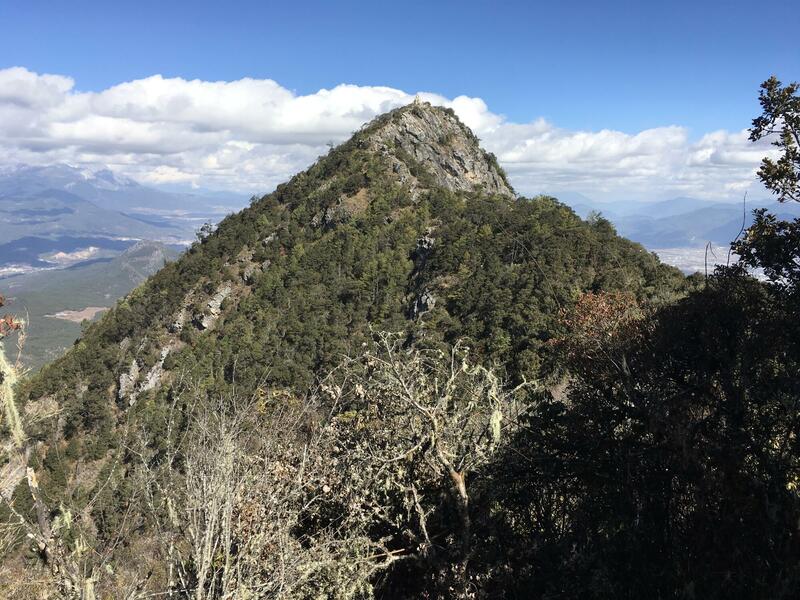 One told me the hike to the top of the mountain took two hours, assuming good physical condition and acclimatization. And that's how it turned out. 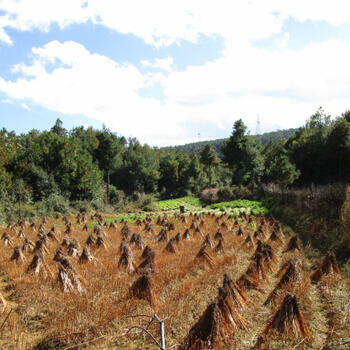 Along the way I passed fields cultivated by residents of nearby Wenping Village (文平村), an agricultural hamlet of two dozen homes. Harvest season had arrived and the reapers offered me a vegetable that looked like a turnip. They called it ma-chee. 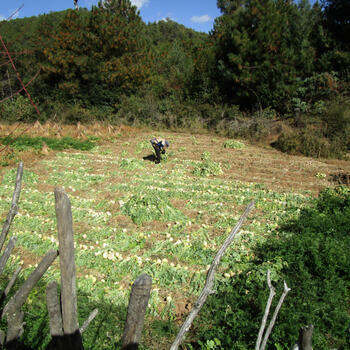 Back in Lijiang, the cook at my guest house recognized it as manjing (蔓菁) and served some up for the evening meal. Food from the trail, a satisfying way to end the day! 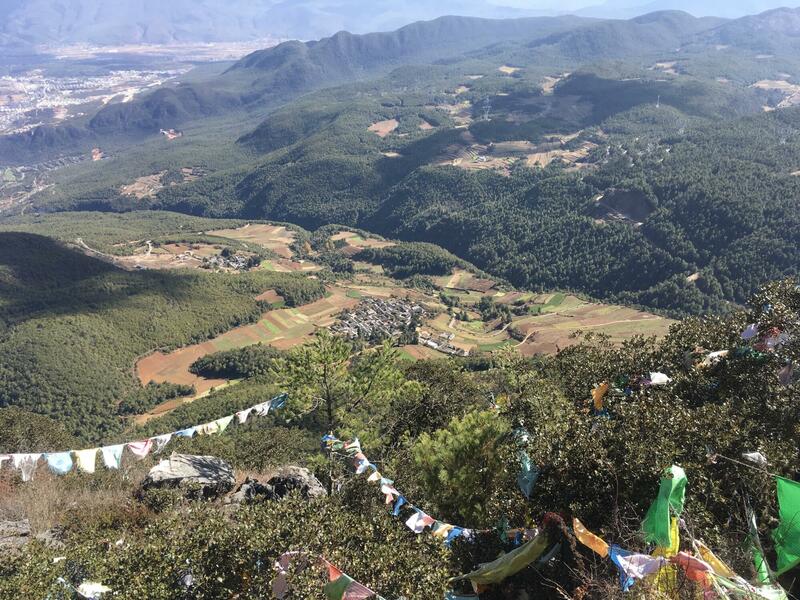 On the summit, hundreds of prayer flags fluttered in the wind, attached to a tall monument of stones with a Buddha deity sitting serenely to the side. 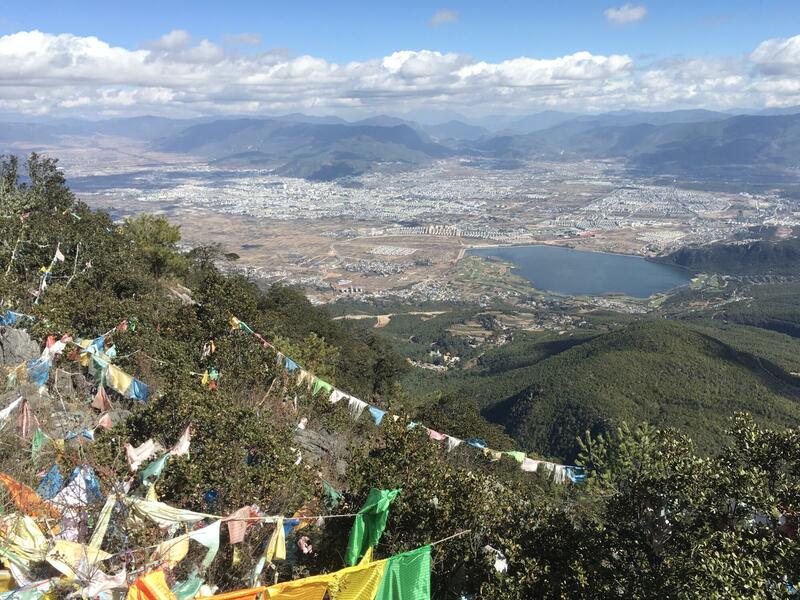 The city of Lijiang spread across the valley to the east, while Lashi Lake and Jade Dragon Snow Mountain appeared in the north. 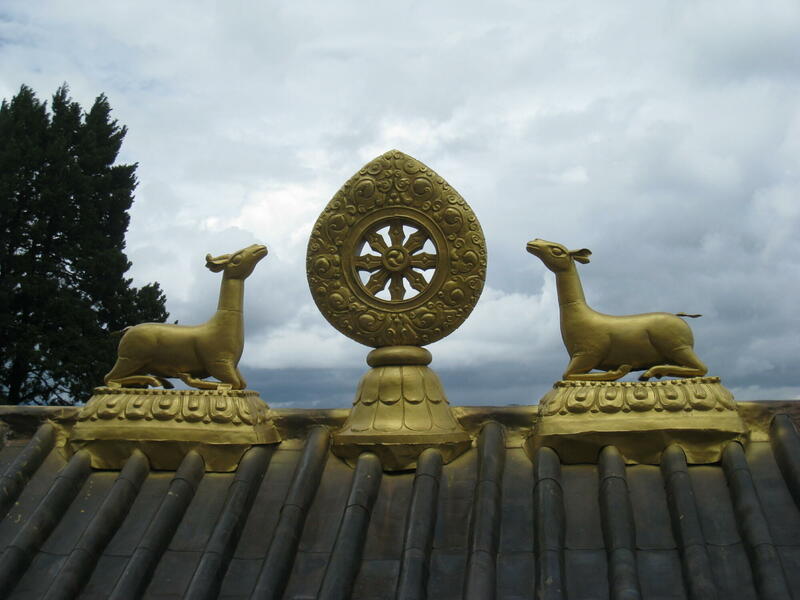 Looking straight down, or seemingly so, I glimpsed the golden roofs of Wenfeng Temple where I had started. 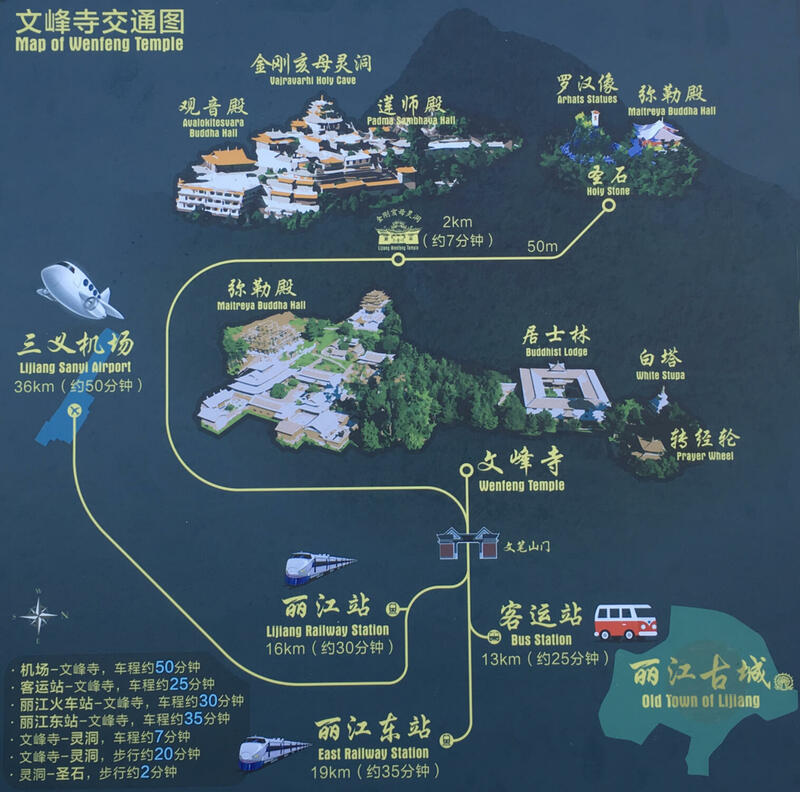 The new Lijiang-Shangrila railroad emerged from underground passageways. Mountains ringed the horizon. 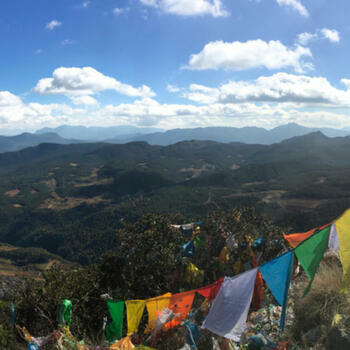 A rewarding panorama all the way around. 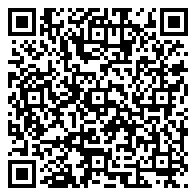 You will encounter multiple paths along the way, so please use common sense. Take note at intersections to ensure you can retrace your path on descent. 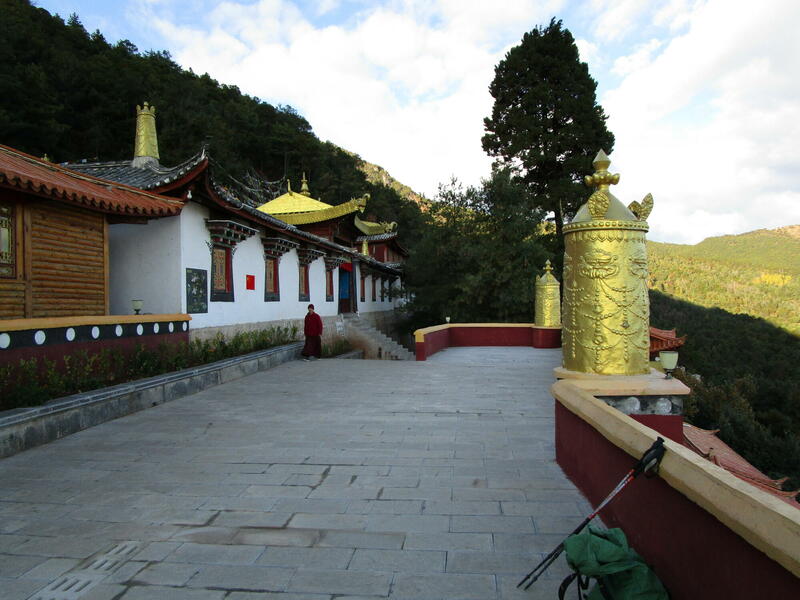 From the parking lot at the upper compound of Wenfeng Temple, walk up the steps to the plaza. 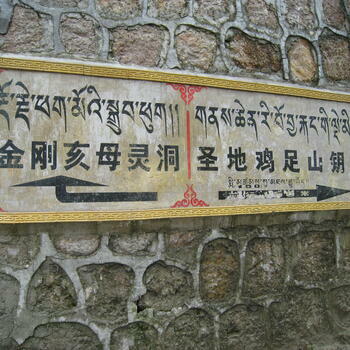 The entrance to the compound is on the left after a hundred meters. 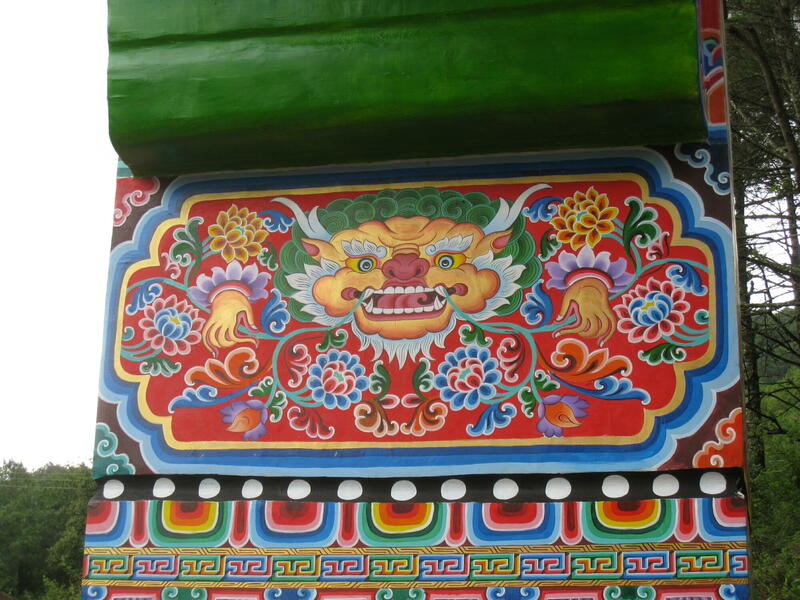 Continue straight ahead, descending steps that lead to a giant prayer wheel. The paved footpath skirts the compound in a westerly direction, gradually gaining elevation. 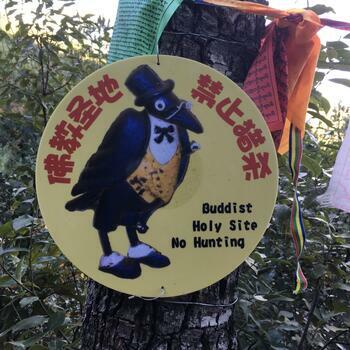 After a few minutes arrive at a cluster of buildings, including residences for Buddhist nuns which are off limits to the public. 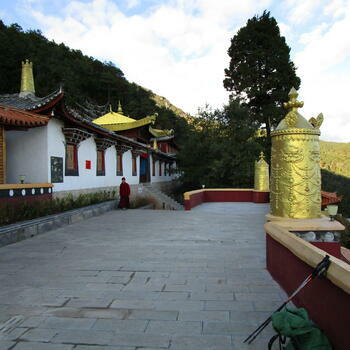 Just beyond pass between the Arhats circle on the left, and Maitreya Buddha Hall on the right. 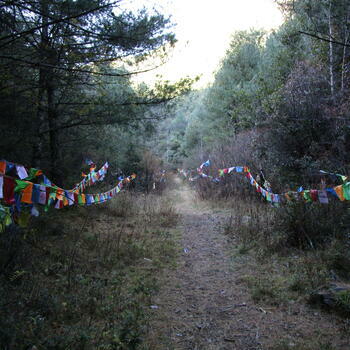 Pass a small hut and continue on a dirt path lined with Tibetan prayer flags. 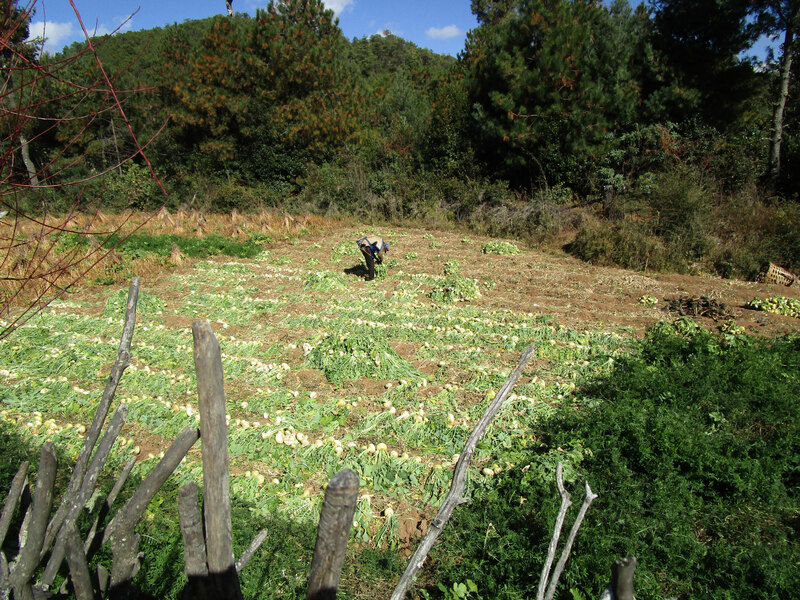 The trail gains little elevation at first, then climbs steeply to a dirt road. Local vehicles and residents ply this road. Make special note of this intersection for the descent. Continue straight ahead on the road, heading toward high voltage power lines visible far in the distance. 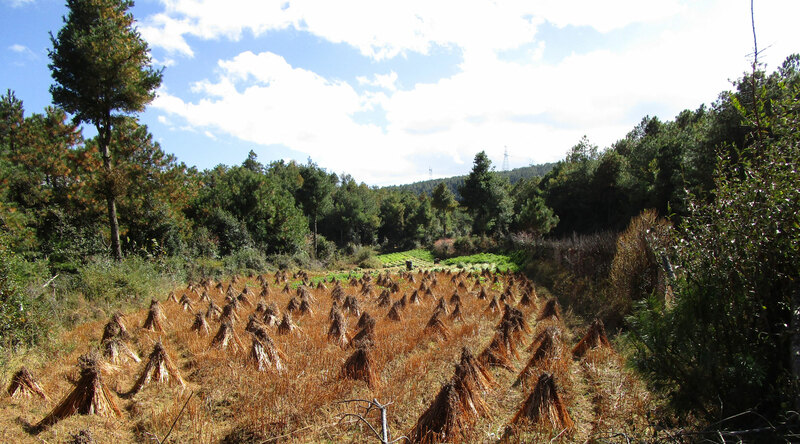 Pass cultivated fields on both sides of the road. After three hundred meters, turn right onto another dirt road. 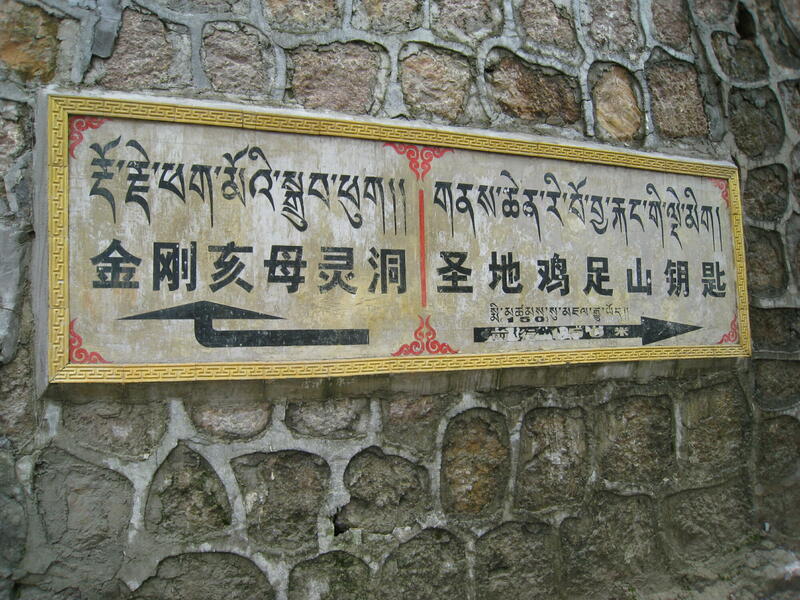 Here, the main road extends straight ahead and descends a short distance to Wen Ping Village. 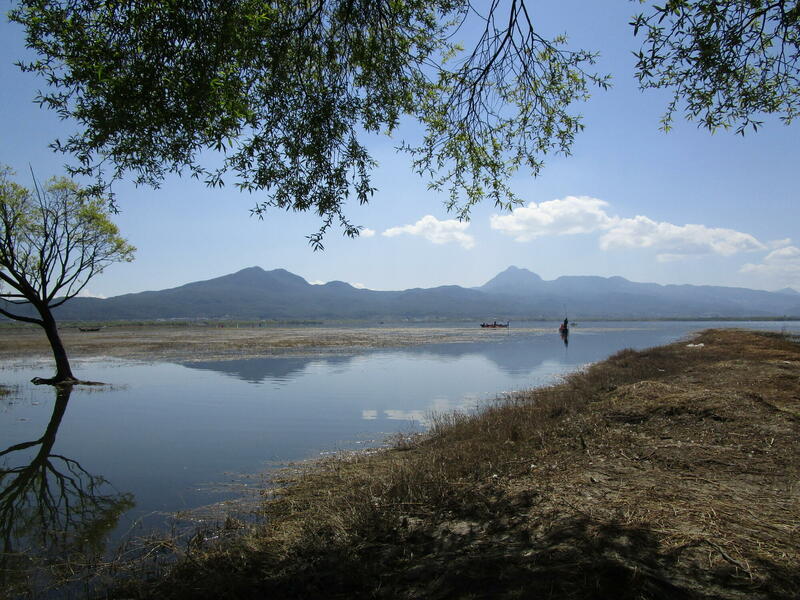 After turning onto the new road, continue thirty meters to a well-beaten track on the right. 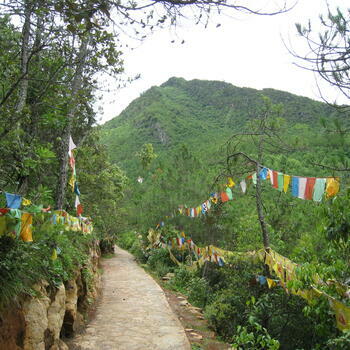 The track ascends steadily and eventually arrives at the southeast shoulder of Wenbi Mountain. A number of paths intersect or diverge from the track. 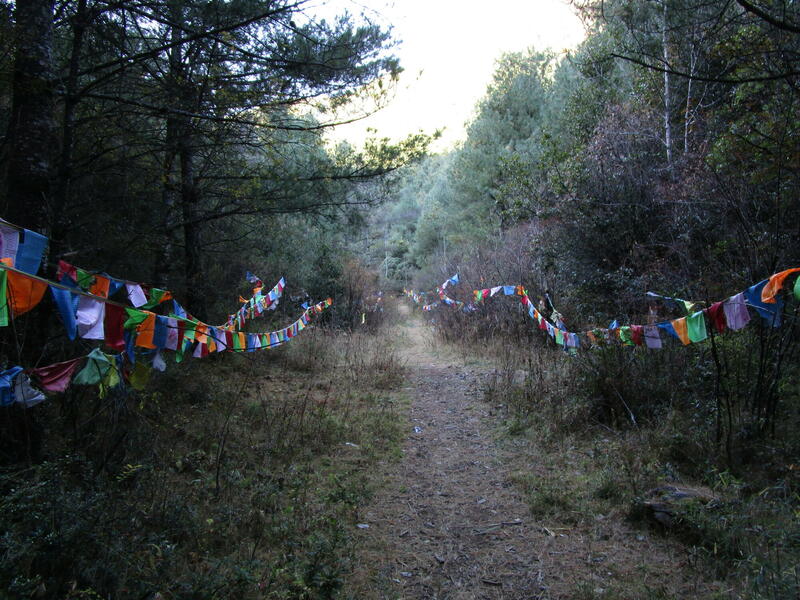 A good bet is to stay on the path with the most well-defined foot bed and the most prayer flags. From the southeast shoulder there is a good view of the final ascent. 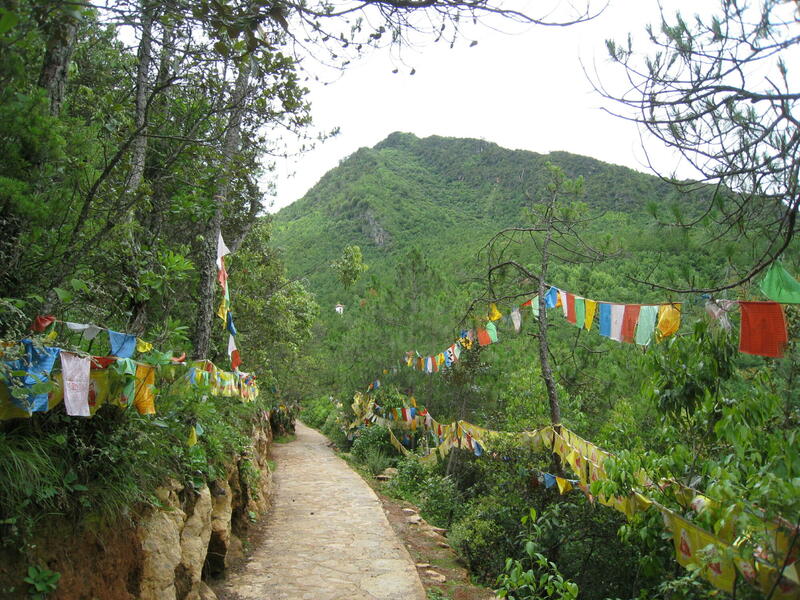 The trail zig-zags up the slope and is marked by prayer flags, some are which are visible from below. The path turns right and descends slightly before switch-backing up the steep south face. The trail tops out on the ridge between two summits. Turn left for a short hike/bushwack to the south summit, with a fine view toward the north summit. 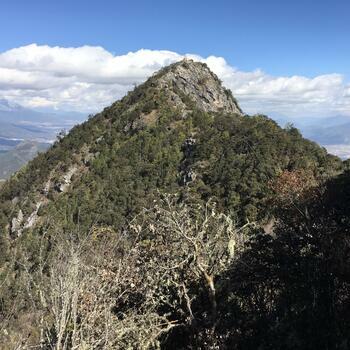 Continue along the ridge to the north summit, the true peak of Wenbi Mountain, elevation 3,430 meters. 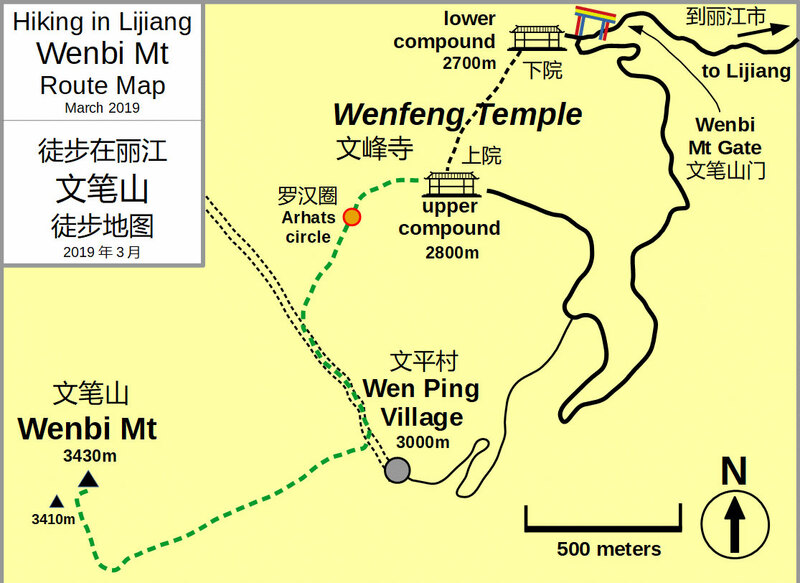 From the upper compound of Wenfeng Temple to the summit — with an elevation gain of 650 meters — takes two hours. 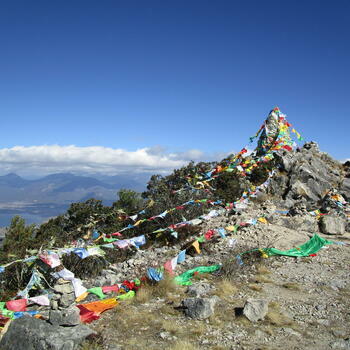 The entire hike, including the drive from Lijiang and return, takes 5-6 hours. 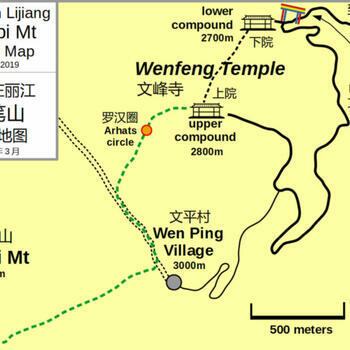 By bus: There is no bus service to Wenfeng Temple. 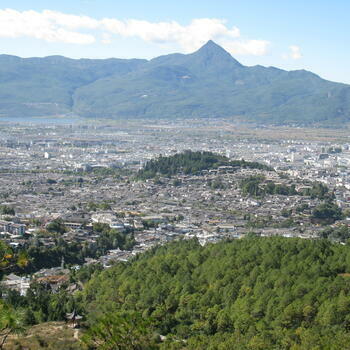 Bus 19 reaches closest and can be boarded on Changshui Road (长水路) on the south side of Lijiang Old Town. 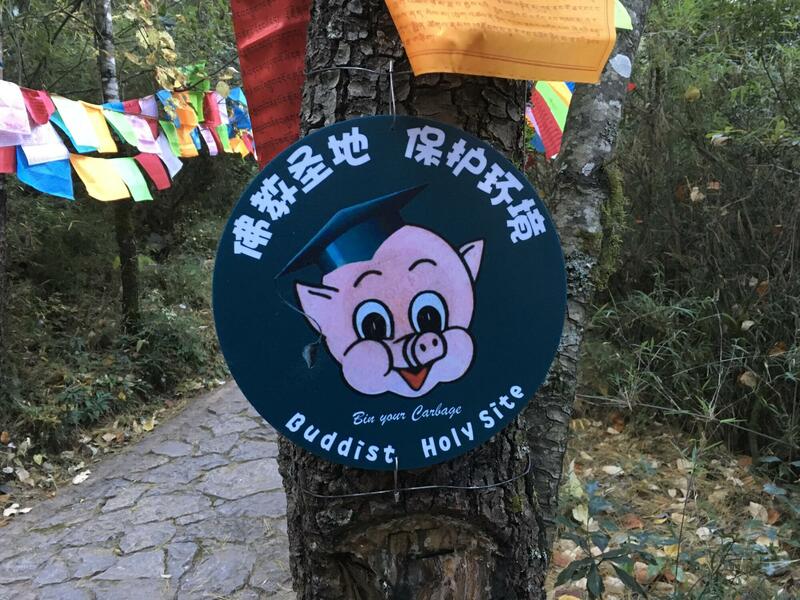 From the bus stop farthest outside the city, where the road makes a sharp turn, a two- to three-hour walk brings you to the temple's upper compound. 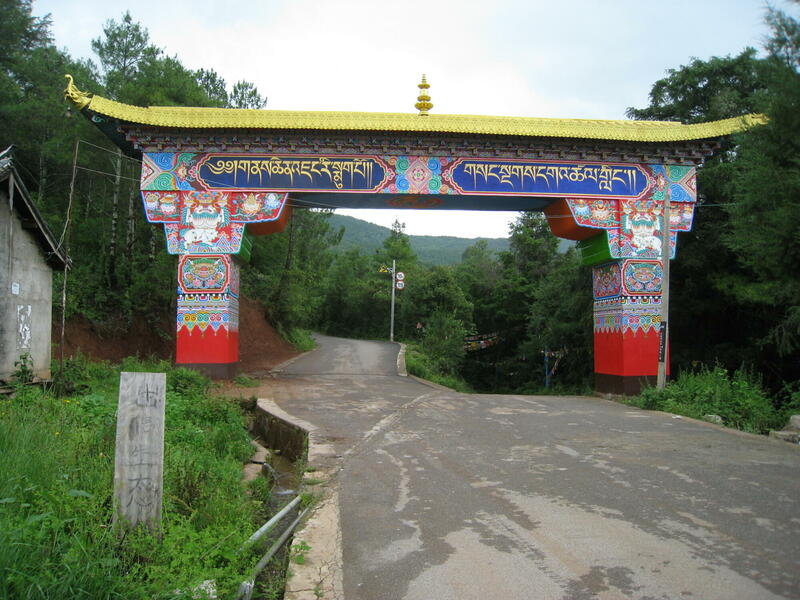 After seven kilometers on the road, pass through the colorful arch of Wenbi Mountain Gate (文笔山门) and take the right fork down to the lower compound. Ascend a paved path for less than a kilometer to reach the upper compound. From the parking lot there, hitchhiking back to town is a viable option. 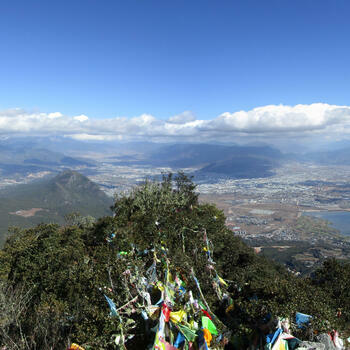 By car: Driving from the center of Lijiang to the upper compound of Wenfeng Temple takes 45 minutes, a trip of about 20 kilometers. 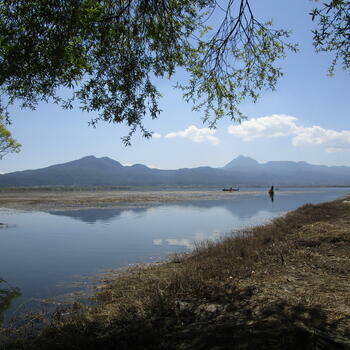 Drive southwest out of the city on Qingyun Road (庆云路). 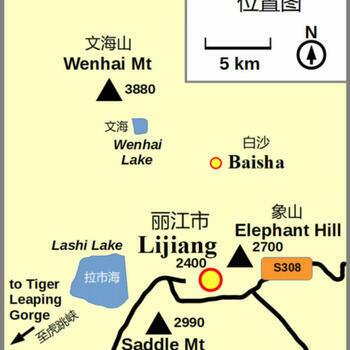 Where the road makes a sharp turn, turn off and start up the mountain. 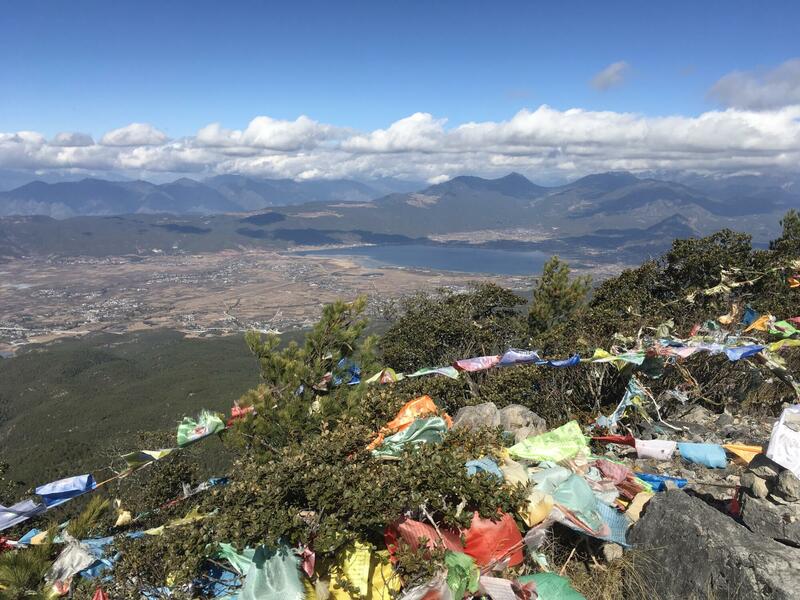 After four kilometers, pass under the Lijiang-Shangrila Railway — currently under construction and due for completion in 2020 or after. 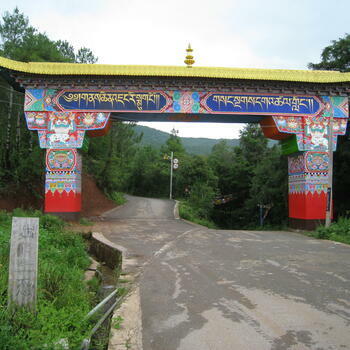 At seven kilometers, pass through Wenbi Mountain Gate, taking the left fork. At 11 kilometers, you will arrive at the parking lot for the upper compound. 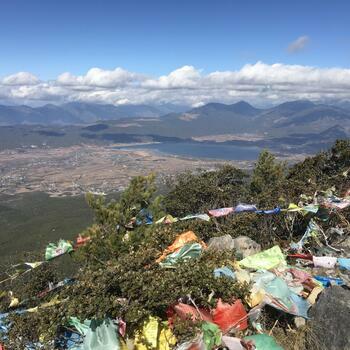 see his two-part article on circumambulating Haba Snow Mountain, as well as his explanation of where and how to hike Elephant Hill just outside of Lijiang Old Town. 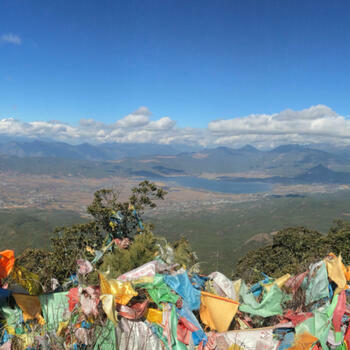 One of my favourite hill climbs i Lijiang. 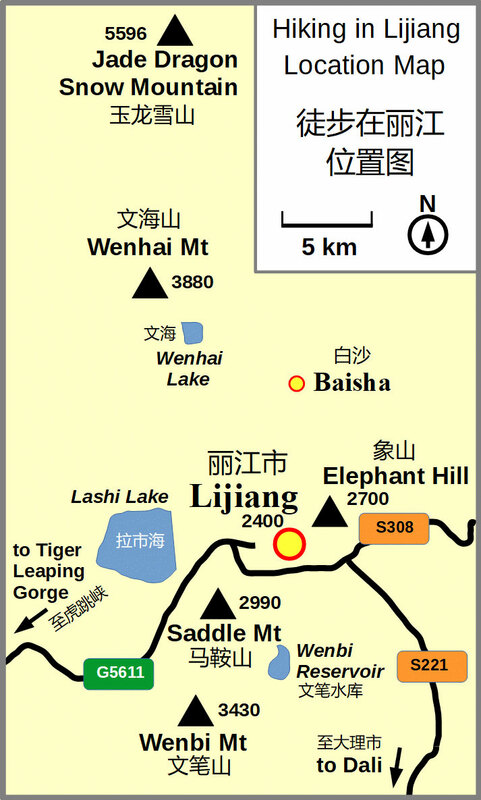 For those on two wheels, it's a nice ride up and back down but bring lots of snacks/water as there's no shop up there. There are some nice trails to ride down if that's your thing but be aware that some are crossed by retaining walls and it can be difficult to see the drops which are up to 1 meter.